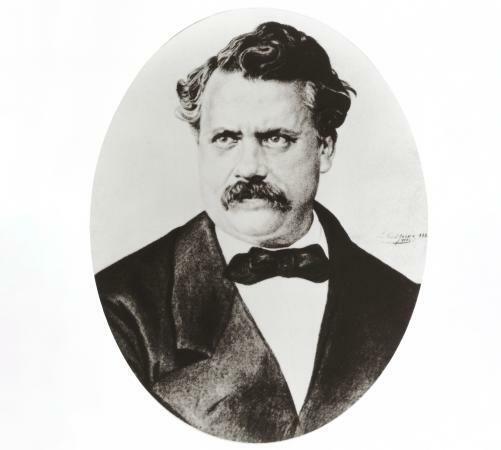 Born in 1821 in Anchay, France, Louis Vuitton worked as an apprentice for the packing-case maker M. Maréchal, where he created personal luggage for Empress Eugénie before setting up his own business in 1854. Vuitton's career as a craftsman trunk maker quickly brought him an ever-expanding roster of clients, requiring him to move to workshops at Asnières, on the outskirts of Paris, in 1859. The workshops remain at the original site, and this is where all the luggage and accessories are still made. Annexed to the workshops is the family home, which is now a museum. Vuitton's first innovation was to pioneer a gray, waterproof canvas (Trianon), which was stretched across the poplar wood structure of the trunk, eliminating the need for a dome-shaped lid, which had been essential for repelling rain from the trunk during transit atop a horse-drawn carriage. This innovation enabled porters to stack trunks one on top of the other, allowing travelers to take more luggage with them on trips. Vuitton's success in the luxury luggage market was due to his willingness to modify and custom-build luggage that was adaptable to new forms of transportation. For example, cabin trunks for ocean liners were designed to fit under daybeds so as to maximize use of space. Yet what the luggage contained was never a secondary concern, but of equal value in the definition of first-class travel. To meet the needs of these elite travelers, Vuitton devised the wardrobe trunk with interior drawers and hanging space with the advice of the couturier Charles Frederick Worth. As the company prospered, its products were widely imitated, forcing Vuitton to change the canvas design from a striped to a checkerboard (or Daumier) design. His son Georges created the famous monogram canvas in 1896. The design was intended primarily to combat commercial piracy, although its orientalist, decorative design also reflected the fashion for all things Japanese at the end of the nineteenth century. Beyond the initials that feature as a tribute to his father, Georges's design bears three abstracted flowers, based upon a Japanese mon or family crest that, not unlike a coat of arms, was traditionally used to identify items made for and owned by a particular family. International stature was assured for the company by the opening of a London store in 1885, a French store opposite the Grand Hotel in 1871, and distribution in America through Wanamaker's department store in 1898. Design awards at the Exposition International d'Industrie et des Arts Decoratives of 1925 secured the company's reputation for grand luxe in the art deco style. Later in the twentieth century, handbags, wallets, and other small leather goods became increasingly important parts of the company's product line, as luxe travel with numerous trunks and suitcases became largely a thing of the past. In 1997, the company hired the American fashion designer Marc Jacobs to design accessories and clothing. A commercial and critical success, the ready-to-wear collections have been central to the continued success of Louis Vuitton. Limited edition pieces produced in collaboration with other creative artists have resulted in some of the wittiest and shrewdest reworkings of brand identity. Fashion designer Stephen Sprouse (2001), British fashion illustrator Julie Verhoeven (2002), and Japanese artist Hideo Murakami (2003) have created some of the most popular designs. The Stephen Sprouse collaboration was inspired by a visit Marc Jacobs made to Charlotte Gainsbourg's apartment, where he noticed a Louis Vuitton trunk that had once belonged to her father, the French singer Serge Gainsbourg. Gainsbourg had so disliked the status implied by the canvas design that he had tried to erase the symbols with black paint. Yet as the design is produced as a woven jacquard, he only made the design appear subtler, and in turn, more sophisticated. Sprouse was inspired to add graffiti over the monogram canvas in fluorescent colors as an ironic act of defilement. Yet the graffiti design only served to reinforce the status of the brand and its association with street credibility. The consumption of luxury brands by American hiphop performers, termed bling-bling, created a new and younger market for Louis Vuitton. This new market was memorably represented by the performing artist Lil' Kim, who posed on the cover of the November 1999 issue of Interview magazine naked, her body painted with the Louis Vuitton monogram. Because they are such desirable status symbols, Louis Vuitton products are subject to intense counterfeiting, which the company vigorously combats. Vuitton remains the most prestigious and easily recognized brand of luggage. See also Leather and Suede; Logos. Forestier, Nadege, and Nazanine Ravai. The Taste of Luxury: Bernard Arnault and the Moët-Hennessy Louis Vuitton Story. London: Bloomsbury Publishing, 1993.